I found this recipe on the Sprout People website: http://www.sproutpeople.com We used organic extra virgin coconut oil, for the oil, which worked great. You could also use butter. We’ve bought some terrific sprout mixes from them, including Amber Waves of Grain (a mix that contains: wheat, barley, rye spelt, triticale, oats, kamut, sesame, millet, amaranth & quinoa) – which we used to make this bread. It’s a great recipe and was a big hit with the teenagers. Our three loaves were gone in three days! You can use any grain to sprout, the Amber Waves of Grain mix, Wheat, Rye, Kamut, Quinoa, Spelt, Triticale, etc. 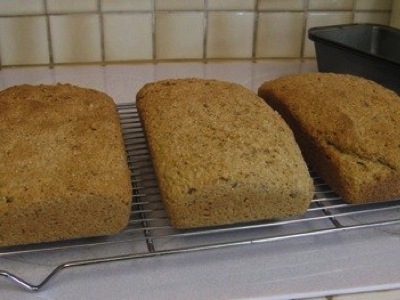 Start sprouting your grain 2-3 days ahead so it’s ready for when you want to make your bread. I started sprouting the grain Friday morning and we made the bread on Sunday. I also used all whole-wheat flour, that I ground from spring wheat, right before we made the bread. Oh, and I made it in my mixer, which worked great. We only did a few minutes of hand kneading when we put it out on the lightly floured surface. 2 Cups Sprouted Grains – we ground them up in the food processor – you can use them whole if you’d like too. Cover and let this “sponge” sit 45-60 minutes. Place dough into a greased bowl – turn it over and around to coat the whole of the dough. Cover and let rise until doubled (60-90 minutes). Knead dough down in the bowl, divide and shape into 2 – 3 oblong loaves. Place in well-greased loaf pans and cover. Makes 2 – 3 loaves. Enjoy!